The prime minister announces the dispatch of troops and combat aircraft. Prime Minister Tony Abbott announced Sunday that Australia will deploy military forces as part of the U.S.-led international coalition to fight the Islamic State, which continues to occupy large swathes of territory in northern Iraq and Syria. The Australian Defence Force will deploy up to eight Royal Australian Air Force (RAAF) F/A18 combat aircraft, an E-7A Wedgetail Airborne Early Warning and Control aircraft, and a KC-30A Multi-Role Tanker and Transport aircraft. A special operations task group will also be assembled to act as military advisers to the “Iraqi and other security forces” fighting ISIL. This includes around 600 Defence Force personnel – 400 from the RAAF and 200 from the Army. The government’s decision came after a formal request was received from the United States to contribute military forces to the international coalition, which includes Britain, France, Canada and Turkey, among others. Until recently, Abbott had qualified most of his statements about possible military involvement in Iraq as being dependent upon receiving a “specific request” from the Obama Administration. The decision should come as little surprise to most Australians, however, as the government has steadily inched closer to this point, from providing humanitarian assistance and participating in international supply missions to arming Kurdish Peshmerga troops, and now, military deployment. Although the prime minister was careful to clarify that Australia is not deploying combat troops, he did warn Australians “that should this preparation and deployment extend into combat operations, that this could go on for quite some time.” The most recent sign that the nation is back on a war footing came a mere two days earlier with a revision of the threat assessment at home. Security and intelligence agencies are particularly concerned about the “increasing numbers of Australians working with, connected to, or inspired by terrorist groups such as ISIL, Jabhat al-Nusrah, and al-Qaeda.” They believe the threat has been increasing for more than a year and merits the high alert level, which signifies that a terrorist attack in Australia is likely. The threat level was first moved from low (terrorist attack is not expected) to medium (terrorist attack could occur) following the September 11 terrorist attacks in 2001, where it had remained for more than a decade. With a heightened threat assessment, the rhetoric has shifted dramatically. Western leaders, including Abbott, are now drawing a much clearer link between the threat posed by the Islamic State in northern Iraq and Syria and the possibility that this could evolve into a terrorist attack at home. Fear of the latter seems to be weighing heavily on officials’ minds as countries like France and Britain consider taking action to block citizens from leaving to take part in terrorist activities abroad and, in the event that they do, prevent them from returning. The Australian government, for one, has already cancelled passports based on security concerns about a number of Australian citizens, preventing them from traveling overseas. 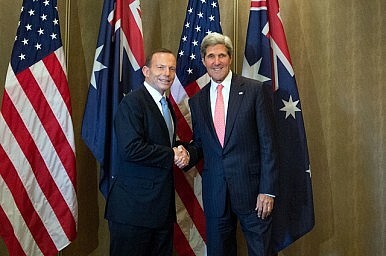 On September 24, Abbott will visit New York to attend a United Nations Security Council meeting, chaired by U.S. President Barack Obama, to discuss the issue of foreign terrorist fighters. A draft resolution obtained by Reuters proposes the Security Council demand countries “prevent and suppress” the recruitment and travel of foreign fighters to join extremist militant groups. Domestic laws and regulations would ensure that any citizens traveling, funding or assisting others “for the purpose of the perpetration, planning, or preparation of, or participation in, terrorist acts” would be prosecuted for criminal offenses. Here again, Australia is largely in line with the consensus. The government has committed more than $630 million* to boost the counterterrorism efforts of the Federal Police, Customs and Border Protection, ASIO and other agencies. A considerable portion of this investment is focused on strengthening community engagement programs, facilitating cooperation across agencies, and investigating and prosecuting suspected extremists. But part of this funding has been put aside for AUSTRAC, which monitors financing to terrorist organizations. The government hopes that with greater analytical capability, AUSTRAC will be able to more effectively cut off financial support for terrorists, while also working with other security agencies to disrupt terrorist activities. Most of these recent actions, however, have been driven by the executive with very little scrutiny or debate from the Opposition, which is broadly supportive of the government’s measures so far. Whether the general public feels the same way is difficult to say. A Newspoll survey conducted for The Australian shortly before the announcement found that 62 percent of respondents supported the action taken by the government, including humanitarian aid drops and the shipment of weapons and ammunition. The shift in the nature of Australia’s involvement, however, may push this figure down somewhat. Much will undoubtedly come down to the length and success of the mission. With the prime minister suggesting it could take “months rather than weeks,” the deployment is unlikely to be the last step the Australian government takes in the fight against extremists. *Corrected from “billion.” Thanks to commenter Kanes for pointing that out.